Windows 8 adds a built-in antivirus, formerly Microsoft Security Essentials, and now calls it Windows Defender. Here’s how to add it to the Context menu. 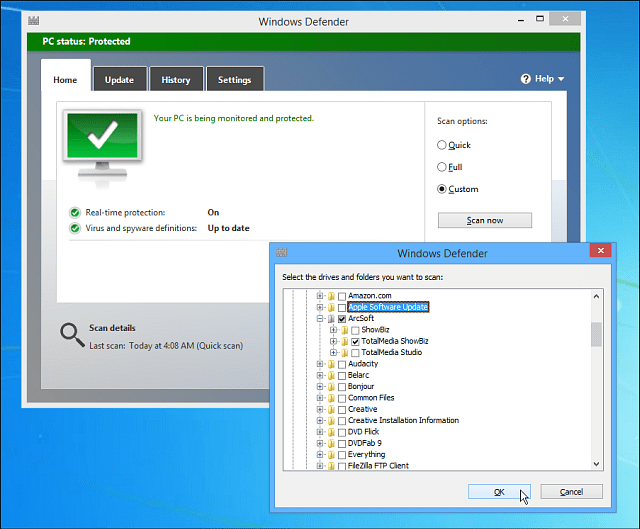 Windows Defender is the built-in antivirus and antimalware security utility in Windows 8.1, and it isn’t like anything in previous versions of Windows. It includes our favorite Microsoft antivirus utility Microsoft Security Essentials (MSE) and includes malware detection which now is simply called Windows Defender in Windows 8 and above. This makes Windows Defender an antivirus and malware solution that’s completely free, and built-in to the OS. The virus definitions are regularly updated in the background and it gives you real-time protections against intruders. So while Windows Defender in Windows 8.1 is great real-time protection against viruses and other malware, you might want to double check on some of your drives (removable drives mainly come to mind here) or folders. 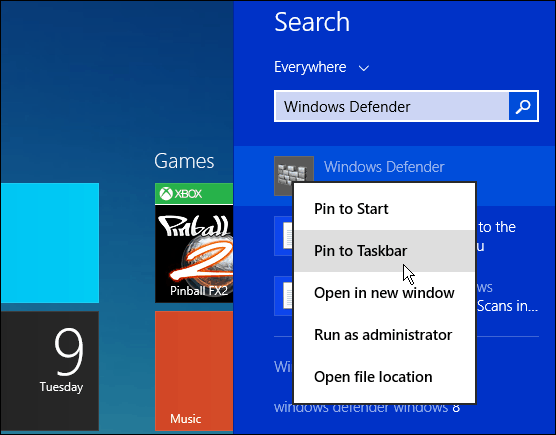 First launch Windows Defender from the Start menu, and while you’re there, you might want to right-click on it and add it to the Taskbar. Under the Home tab select Custom, then click Scan Now. That will open up File Explorer so you can select the drive or folder you want to scan – click OK. While you can’t scan individual files with Windows Defender like you can with MSE, it does scans all of the files that are located in a folder. If you want to scan an individual file, check out VirustTotal which scans your file (up to 65 MB) against over 40 different antivirus programs. If you want faster access to Windows Defender, you might want to add it to the right-click Context Menu. 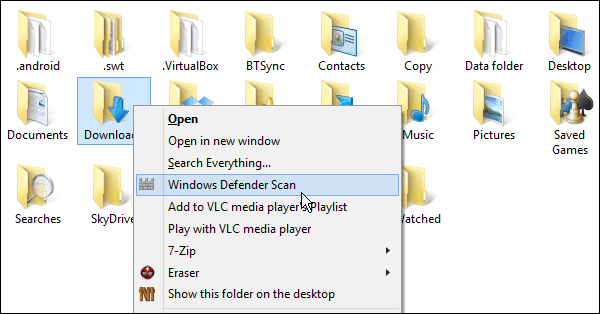 That allows you to right-click a folder and use Windows Defender to to scan it quickly for possible threats. Note: Doing this requires a fairly detailed hack of the Windows Registry which should only be done if you know what you’re doing. 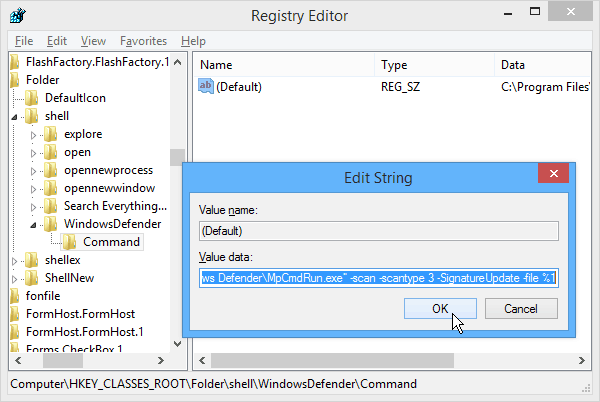 Of course, before making any changes to the Registry, back it up first or create a Restore Point. 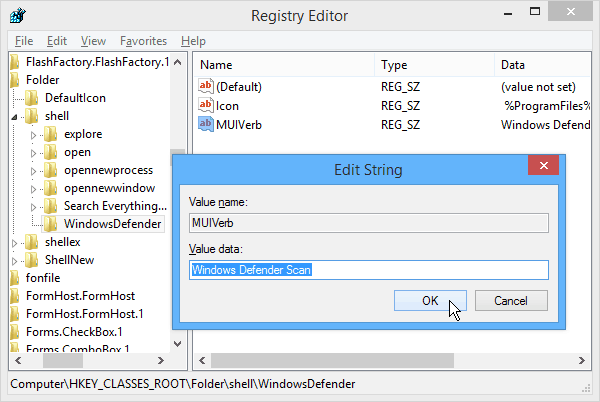 Next create another String Value and name it MUIVerb and set the Value Data to Windows Defender Scan. Note: If you copy and paste the command in, make sure to change the quotes (“) directly in the Value data field so they are straight-quotes – not smart quotes. 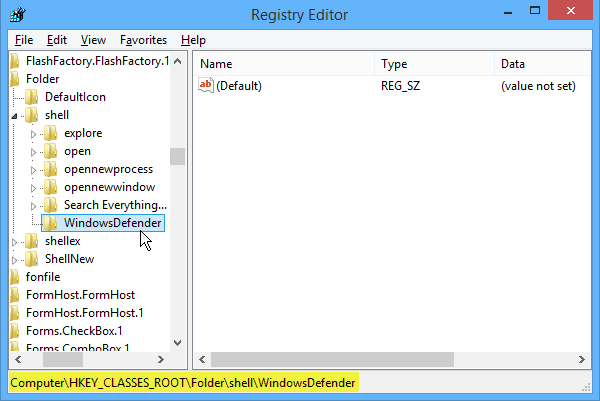 Click OK and close out of the Registry Editor. And that’s it! 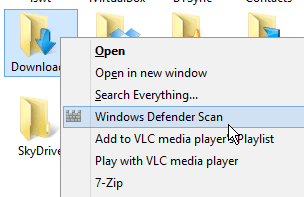 Now any time you right-click on a folder, you will get the option to scan it with Windows Defender. Hi I am trying to turn Windows defender on and it says the app has been turned on and I get no option to turn it back on what do I do to get it on? Also do I need other virus protection if I use Windows Defender? Thank you. Love you updates they are informative and very helpful. I tried to add a lengthy reply here and it said “I was blocked” please send me an email. hi, tried this as you’ve written (not the different version in the image) and i get the context menu – it just opens the app. it doesn’t do anything. i presume i need to add the -scan etc etc in the 2nd to last image into the registry also?